2019 newest and most complete information about DVD resolution questions. How many of you loved - or still prefer - using DVD and wonder about what correct DVD resolution is for playing on analogue (PAL/NTSC) TV/digital TV? Should we burn a DVD with videos in 720p resolution or any others? Can we upscale DVD resolution to 4K? Well, there are so many mind-numbing questions related to DVD resolution. Let's divide and conquer. WinX DVD Ripper Platinum - [100% clean program] Compatible with Windows/10, it helps you to change or upscale DVD resolution from 480p to 720p, 1080p, etc, and fast convert DVD to MP4, AVI, MPEG, iPhone, Android and more. Q 1. What Is Normal DVD Resolution? Are DVDs in 1080p? A: There are two standard DVD resolutions: 720 × 480 (NTSC, total 345,600 pixels) and 720 × 576 (PAL total 414,720 pixels), both available in 4:3 and 16:9 aspect ratios. So apparently, DVDs are not in 1080p, but 480p. Q 2. Is It Possible to Burn a DVD with 720p HD Video? A: You put into a 720p video and then output a complete DVD disc, which plays normally. And you think you are holding a 1280x720 resolution DVD. Well, actually you omit an important link. The truth is that DVD authoring softwares always automatically convert video to standard DVD resolution for burning. So to some extent, we can give you a positive answer: yes, it is possible to burn a DVD with 720p HD video or video in higher resolution, because all 720p/1080p/4K videos will be downscaled to 480p. But seriously, there is no way to make a DVD with HD resolution videos. The highest DVD resolution is 720x480. How to Burn DVD with 720p Videos? Here we will give you an example of how to burn a DVD with video in 720p resolution. First you need to download the next free DVD Author software, which costs nothing and is completely safe. 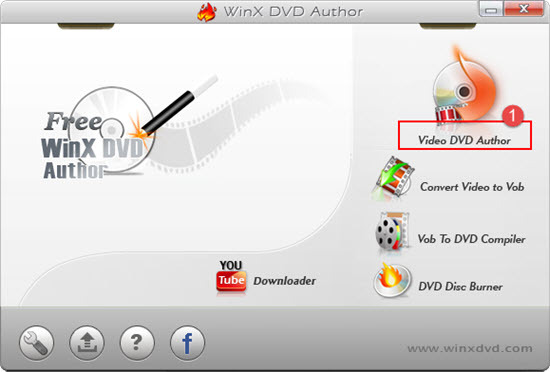 Download WinX DVD Author by clicking the "Free Download" button above, get it installed on your hard drive correctly and open it up. • Insert a blank DVD disc and go into the "Video DVD Author" part. • Click "+" to add a 720p video -> press arrow button -> create DVD menu -> follow the lead to personalize background, music, etc. Set an output folder, and then hit the "Start" to burn video to DVD resolution disc. Q 3. Will Better Resolution Make SD DVDs Look Worse? "I'm thinking of buying an HD television, but I'm concerned about what this will do for my standard-definition DVDs. I took a beautiful SD DVD of _The Asphalt Jungle_ with me to Best Buy, and they played it for me in an "upconverting" DVD player on both a 720p and a 1080p screen; it looked terrible on both, much worse (I think) than on my picture-tube TV. I don't care about making them look better than they already do. I just don't want them to look worse." A: This is really a complicated question, for visual effect is decided by various factors, such as DVD resolution, your display resolution, the display size and the distance between you and the TV. For example, when a 480p video is played on mobile phone, it would be crystal enough, while on widescreen HDTV, barely clear. Theoretically, we do not recommend you upscale DVD resolution to 720p, 1080p or even 4K UHD, because the video quality will not be enhanced a little bit. How possibly could a 720x480 resolution DVD video be successfully changed into 1920x1080, delivering HQ quality? Where do you get the extra large part of frames? Normally, after upscaling DVD resolution to 720p, it also performs the same as the source, not better, not worse. Q5. DVD Resolution and 4K | How Do DVDs and Blu-rays Look on the 4K Screen? A: What 4K TV really do is to upscale the image, spreading 1 pixel to 16/4x4 pixels. There will be no difference on visual effect only if you are watching at a certain distance. If you're up close, you will see there is more black space between the pixels and the image seems to be a little bit fuzzy than before. Part 2How to Burn DVD with 720p Videos?